Afghanistan’s two presidential candidates reached agreement Saturday on an audit of their contested election and on forming a national unity government, regardless of who wins, the Associated Press reported. 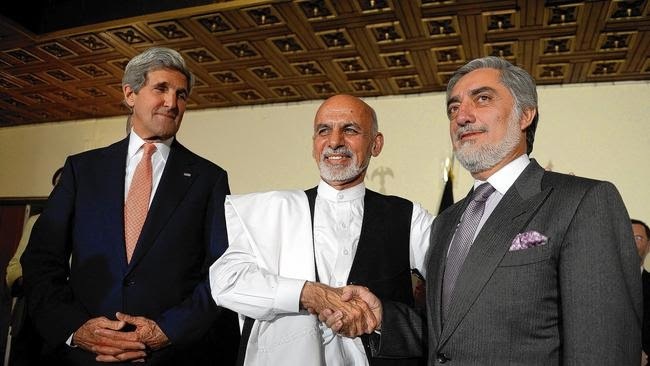 The deal was brokered by Secretary of State John Kerry during his visit to Kabul. Kerry conducted shuttle diplomacy between the two candidates late into the night Friday and on Saturday. Former Finance Minister Ashraf Ghani and former Foreign Minister Abdullah Abdullah agreed to abide by an internationally supervised audit of all 8 million ballots in the presidential election. They vowed to form a national unity government once the results are announced. Abdullah praised Ghani for working toward the accord on the audit and the unity government. Ghani returned the compliments, lauding his competitor's patriotism and commitment to a dialogue that promotes national unity.